The Digitrax DCS50 Zephyr is set at the factory to send 128 speed step commands to all mobile decoders. If you have a non-Digitrax decoder that can’t run in 128 speed step mode, you can change the number of speed steps the DCS50 sends to that decoder so that you will be able to control the decoder. This is called status editing the decoder. When you status edit a decoder, the DCS50 will send a different format to that specific decoder address without affecting the 128 speed step operation of Digitrax decoders and other 128 speed step decoders on the railroad. NOTE: Status editing occurs within the command station and does not reprogram anything in the mobile decoder. It only changes the messages that are sent to the specific decoder address by the command station. The reason that this may happen is that within the DCC format there are several ways decoders and command stations communicate speed step information. All of your decoders and your command station must be “speaking the same dialect of the DCC language” for everything to work smoothly. The Digitrax DCS50 Zephyr is set at the factory to send 128 speed step mode information because the 128 speed step format provides for the best speed control available. All Digitrax decoders are 128 speed step decoders. Some non-Digitrax decoders use other speed step formats and won’t respond to your DCS50 sending 128 speed step information. 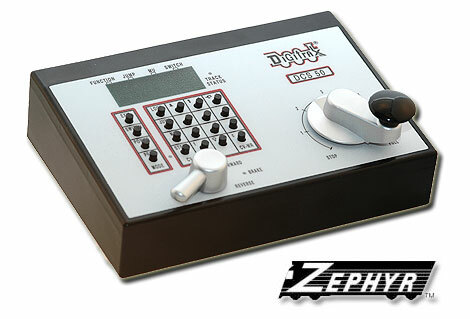 You may find it necessary to change how Zephyr operates a particular locomotive decoder. This happens with older decoders that only operate in 14-step or 28-step speed modes. Zephyr assumes that all locomotives are 128-speed step units, but can be programmed to remember a specific decoder address's speed step settings. 1. Select the LOCO address you want to status edit. 2. Press the STEPS key. The display will show the choices available. You can scroll through the choices by pressing the + or - keys.